So cool you stopped by to get to know me a bit better. (with a bit of a potty mouth). being equal parts practicality and woo. and I want you to love yours too. F*** THIS ... THERE HAS GOT TO BE A BETTER WAY!!!!!!! So ... a few years ago I got serious about ditching my past and creating a future that feels good! It's kinda freaky to be honest with you - experiencing the kind of power we really have. Anyway ... my life rocks now and I left my 27 year career as a Corporate Controller to teach the very things that healed my life! And I learned along the way that teaching is my jam. Win-Win baby!!! So ... I've dedicated my life to teaching others all the tools & techniques that I've used to move past my past and create the life I once thought impossible. Big virtual hugs to you! My precious sons, Zach & DJ. I love those boys so much! Check out my new hat! I'm a huge football fan. Football season ... YES PLEASE!!! 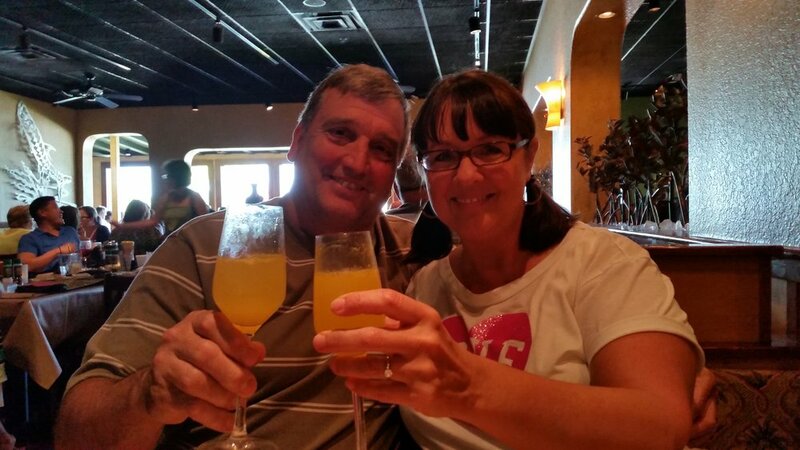 My awesome hubby, Roger, and I having Mimosa's in Florida! My beautiful grand daughter, StellaLuna. Wow ... I had no idea how much my already big heart would expand when this little one came into our lives. Pure bliss!!! You can find all the legal info right here!